Tokyo has many famous districts. Shibuya with Hachiko crossing, Shinjuku and the robot cafe or The Ginza with its designer boutiques and colossal department stores. But Ebisu is a little bit of a hidden gem, rarely spoken of but hugely interesting, buzzing with bars and restaurants and many of the enjoyable old style tachinomi (stand and drink bar). The area is relatively new for Tokyo having been developed early in the twentieth century around the new Yamanote Line station serving the Ebisu brewery (now Ebisu Garden Place). 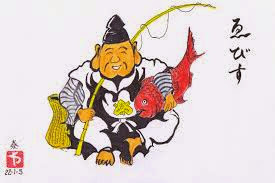 The name comes from one of the seven lucky gods, Ebisu who protects working men and women as well as bringing good luck to young children. But if you arrive in the evening and leave the station through the west exit you'll find crowds waiting to cross the main road (Komazawa-dori) to escape into the little side streets that make it so interesting. Just follow them and soon you'll be lost in izakaya's, sushi restaurants and the occasional gaijin pub, one of which was the head quarters of the Aum cult in its day. A little off the beaten track but definitely worth the visit.